The German obsession with lemons continues. We were standing down in the garage-that-isn’t-a-garage this week talking about the next work to be done when a group of German tourists walked by. They peeked through the gate as they walked past; we said hello as we always do. Ian commented that, before they’d seen him, the two adult males of the group had tried unsuccessfully to pick a lemon overhanging the wall. That’s fine, as far as we’re concerned the lemons hanging over the wall are fair game; we pruned the tree to leave them there, referring to them as the tourist lemons. As we were discussing the ongoing tourist love of the lemons one of the German men walked back to the house accompanied by one of the children, a boy aged perhaps six or seven. We hello’d once more, or rather Guten Tag’d to be polite, and the small boy launched into a carefully prepared question. he said before getting caught up with both nerves and speaking in English to strangers. We helped out by preempting his second attempt. Did he, perhaps, want to pick a lemon? His face split into a huge smile, indeed it was a lemon he wanted. At this time of year there are very few ripe yellow lemons about. The next crop are coming along well but they are currently small and green and without a drop of juice. They look very much like limes. Still we managed to find one of the remaining ripe lemons and his father lifted him up so he could pull it off the tree. Satisfied with his possession he and his father both thanked us politely and went on their way to catch up with the rest of their group. 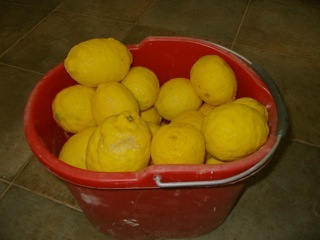 Having two mature lemon trees means that we have masses of fresh lemons for much of the year. 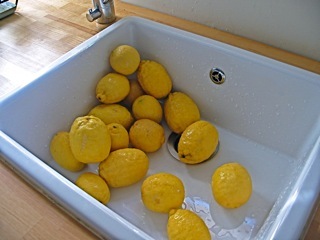 However, even when our lemons were sourced from UK supermarkets we went out of our way to get every last bit of use from them. Feel cheerful at the lack of effort involved in cleaning the microwave and the economy of using nothing but lemon ends which would have been discarded otherwise. 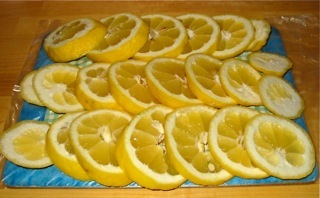 The house smells of lemons. We smell of lemons. Right now it seems as if the entire world may well be lemon scented. 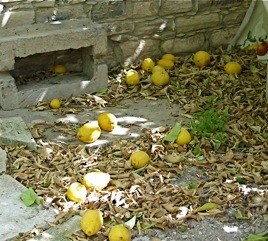 Today seemed the perfect opportunity to deal with the stockpile of windfall lemons from the trees. It being our very first full year of lemon tree ownership we’re still getting to grips with managing the trees including when to harvest lemons to get the maximum amount of juice. As a result of that, and combined with some high winds, we had a fair number fall from the trees. About 50 or so. The plan was to wash them, halve them, juice them and then freeze the juice in handy sized volumes. Because the lemons had fallen we decided to forgo the zest this time. It seem, having never juiced that number of lemons, we may have slightly underestimated the amount of time it takes to process that many lemons. Several hours after starting we have a freezer full to the brim with lemon juice – a little over 4 pints (English pints so 80 fl oz all told) frozen in differing quantities. There are lots of containers holding 4 fl oz for marinading meat for fajitas. A good supply of 2 fl oz lollipops for lemon cakes and muffins and a dozen or so half ounce ice cubes for salad dressing and recipes which just need a small amount of juice. 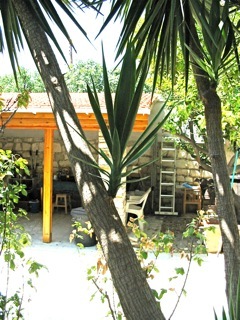 As all this work was going on we could hear from the garden the sound of yet more lemons falling from the trees. It seems unlike that we’ll run out this year. Another month, another round-up of the garden. 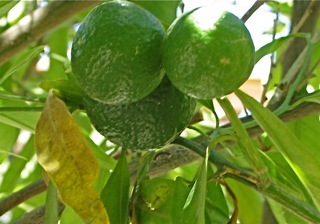 The main lemon crop needs picking. Strong winds over recent days have dislodged a good number of ripe fruit; happily there are dozens more on the tree still. Our biggest challenge is finding homes for them. There’s no question that we can use sliced lemons, zest and juice throughout the year and within a few months there won’t be ripe lemons left on the trees. The only issue is just how much we can squeeze into the freezer. The arum lilies have decided that they’ve had enough for this year. The last of the flowers have gone and the foliage is dying back. Once it has gone completely we’ll be able to have another attempt at lifting the remaining rhizomes and relocating them to elsewhere in the garden. The narcissi have already had similar treatment; they were scattered in and around the area containing the monster yucca. Having tied them up some months ago and allowed the foliage to die back we spent the good part of an afternoon searching them out and lifting them. 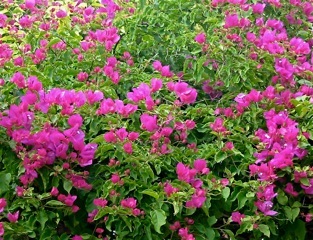 The plan, such as there is one, is to plant them in a series of containers which can then take centre-stage when they are in flower. 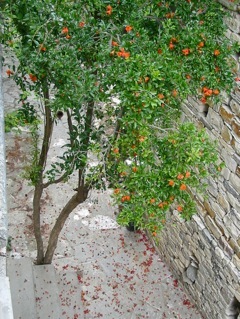 Elsewhere the pomegranate trees are in full bloom. 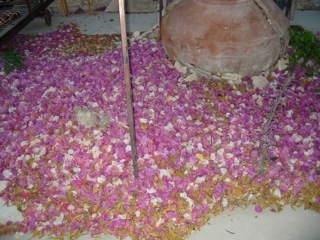 The flowers are absolutely fantastic and as the fruits set the petals fall from the tree creating a delicate red carpet across the donkey track. Were it not for the minor rodent issue we would be absolutely over the moon with the amount of fruit we might expect. The pomegranate isn’t the only one bursting into life. 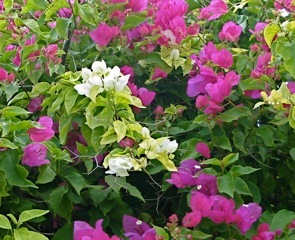 Last month we mentioned that the bougainvillea was putting on a massive amount of growth and the first colour had recently appeared. In less than a month it has gone from a tiny amount of coloured bracts to being absolutely stunning. As an added advantage, when the plant had this much growth it provides good and solid shade underneath which, as the days heat up, is very welcome. Sometimes for a little effort, and perhaps some mess, it is possible to make a product that is superior, cheaper, bespoke and more natural than similar items in the shops. 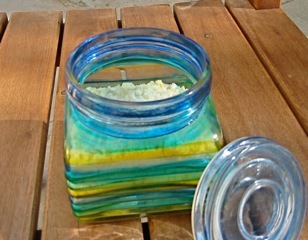 Citrus body scrub is a fantastic example. If you know people who don’t follow this blog (Really, you do? How is this possible?!) then you may even be able to take said item, pop it in a pretty jar, wrap some ribbon around it and gift it as a Christmas present or similar. No darling, it’s just a little organic/natural/customised thing I made for you myself! If truth be told this Tried & Tested came about from a glut of useless oranges. To backtrack … when we first looked at the house MadAlex declared that the oranges on the tree in the garden were the best he’d ever tasted. “They are fantastic, dahhhhhling!” He was as designer with a fairly relaxed grasp on reality. Perhaps you may have gathered that from previous posts? Anyway, he picked two oranges from the tree and presented them to us. As we drove home the car was filled with the most fantastic citrus smell. With great anticipation we tried the oranges. 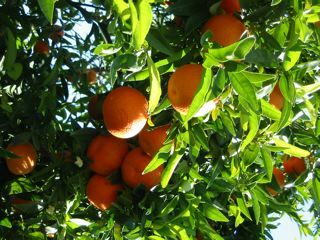 Imagine, a house with a whole tree of the very best oranges in our garden; we’d have to buy the house! Suffice to say the oranges were absolutely rubbish. They look great, they smell wonderful … they taste of water. We tried palming them off on folks but got nowhere. There’s an outside chance that the lack of taste is due to lack of watering on MadAlex’s part, only time will tell. 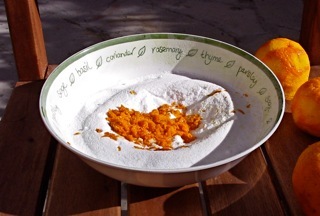 Until then we needed a use for a tree’s worth of un-orangelike oranges and so the citrus body scrub was born. 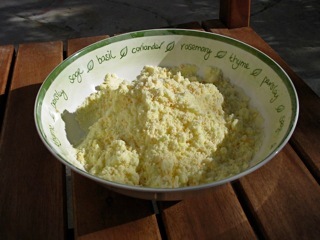 Once you’ve zested the first fruit use a spoon to work the zest through the salt. Apply to damp skin and work in a circular motion. Isn’t is strange how you can see something regularly and not recognise what it is? In the field next door but one to us there are a number of fruit trees. They’re just there, day in and day out. It’s an odd mix of trees rather than a regimented orchard and has assorted citrus trees as well as pomegranates and figs as well as one or two others. Recently we were standing in the lane talking to a neighbour. As we chatted away Ian kept looking over her shoulder at the trees in the field. He’d glance for a moment or two, look puzzled, then return to the conversation for a moment only to repeat the whole process once more. Eventually he broke into the discussion to ask “Does that tree have oranges and lemons growing on it?” To which the answer was “Yes, it does”. It turns out that we have a fruit cocktail tree growing next door to us and we’ve never noticed. Pretty much all of the orange and lemon trees, and a goodly amount of other citrus trees, that grow here are actually grafted on to another tree. 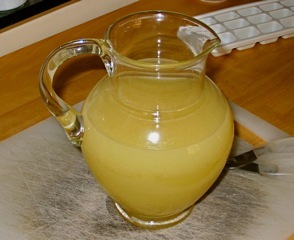 Bitter oranges and rough lemons are usually used as the root stock as they grow so well. Rough lemons have a very thick nobbly skin, sour juice and so many pips that they are not particularly useful for cooking. 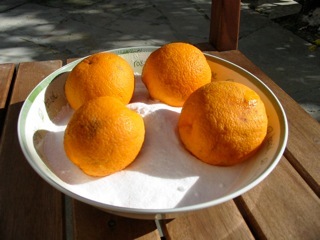 Bitter oranges, as their name suggests, are not in any way suitable for traditional eating. Some time ago we were gifted several dozen. 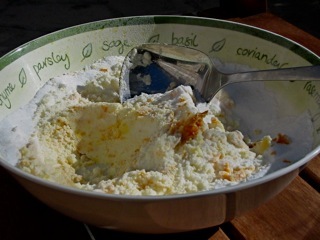 Some ended up in a Christmas syllabub where their tartness was welcome after a rich meal; some became Arancello. 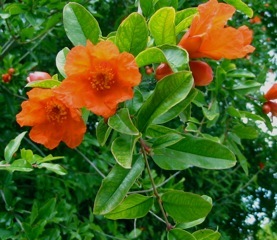 If someone wants a sweet orange then a branch of that is grafted on to a rootstock of bitter orange or rough lemon. Since the root stock will accept multiple grafts there’s no reason why different varieties can’t be grafted onto a single root stock. As such it’s possible to get crops of different fruits from the same tree. 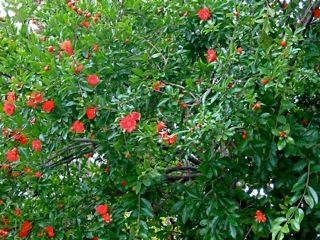 In the US these are often called Fruit Cocktail trees. 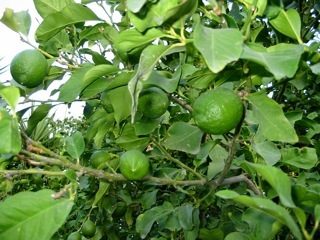 Some time ago we were given a lime tree as a gift. 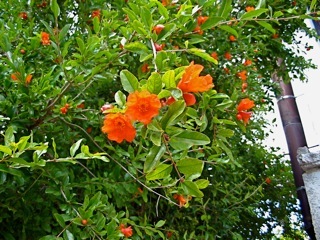 It’s very small and produces a handful of tiny fruit each year. Whilst lovely to have our own limes the tree doesn’t go far in reducing our need to buy limes, we seem to get through a significant amount, so we continue to have to buy fruit imported from South America. As we have two very large and mature lemon trees here the plan had been to try and graft some of the lime tree on to one of them. A single branch of full sized limes would be hugely useful. 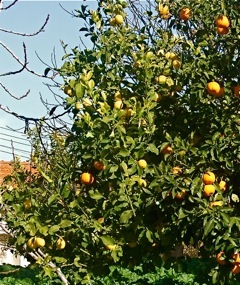 The discovery of the lemon & orange tree nearby might be just the prompting we needed to start the experiment. Edited to add: We weren’t entirely happy with the photo of the orange & lemon tree so we headed back at a later date to get one or two more. They can be found here.